40 pts high to low / 1687 index = 2.37% x sq. root of 252 trading days (15.87) = 37.62 volatility. Of course, that is part of the fun in modeling derivative prices: demand determines the key pricing element of an option, the implied volatility, or expected standard deviation (square root of the variance, or in essence the deviation from the average price over a certain period).Â Just as I discussed in the last post that the option market (re:VIX) was underpricing call options as the S&P made a 7% move off of the April lows. Call options over the last month were making hundreds of percent in days. Now if you believe that the market displayed a key reversal, (it is still May remember, and June is the second worst month for stocks, just thought I’d mention that) you can still get puts uber-cheap, since the VIX barely noticed today’s move. Same for calls if you’re bullish. Straddles may make a nice bedfellow if vol picks up or if you’re nimble enough to trade them both ways. 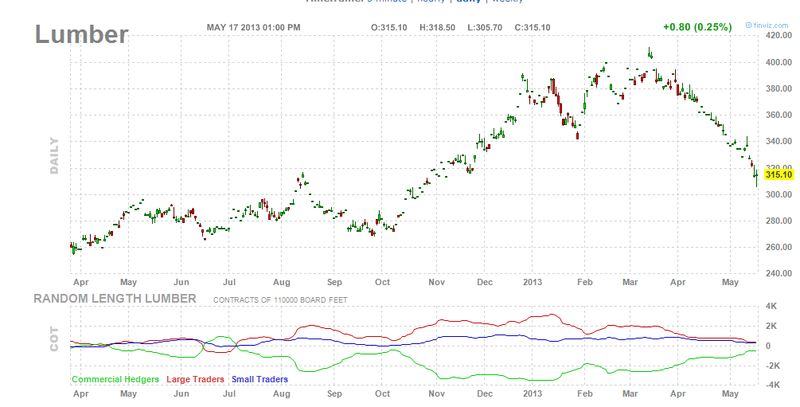 June futures actually fell in a sign of complete faith in the Bernanke. And what does this mean? Who knows, maybe this is the 25% S&P type year of decades past. But GDP and revenue growth existed back in those days, so we are flat out in sentiment stampede if this is going to occur. I digress. Bottom line, options are cheap and today didn’t change that. One of the odd quirks of the VIX, (to me anyway) is that when markets chase higher, or there exists herding behavior causing performance panic in the markets, the call implied volatility doesn’t act like put volatility and rise dramatically, causing the VIX to rise. I suspect that the reason lies in that there are always call sellers regardless of market conditions, but not always put sellers when things get dicey. Thus, no imbalance of supply/demand on call IV. The 170 calls for June 7th rose 200% or so today. If you bought an equivalent call three weeks ago, you would have turned roughly 10 cents into $5. Look at the 160 calls, obviously trading for at least $5. That return, depending on your expiration, would be around 5000% over the last three weeks. So, low volatility in a market such as this gives it to you both ways, in uber-cheap protection and major upside participation. Straddles may be a nice option if you are waiting for an inevitable dip but want to ride the herd at a nice price. That means that there is a five week option cycle coming up as opex comes before VIX expiration. That generally has implications for the market in the short-term and we will cover that later this week. I apologize to readers for the sporadic posts. I’m dealing with the impending CFA exam, so the posts will be limited until after June 1st. Now that everyone is comfortable with May being a breeze, let’s take a look back at how May 2012 unfolded….. The market came back from a mid-month April dip to hit highs for the year on May 1st. On May 2nd, it tried to sell-off, but the buy-the-dippers were quite ready for action, and closed it higher than the open. It rose 50 or so S&P points in the last week of April into the first week of May. Look familiar? Notice how the wicks got long in mid-May as the market battles induced wild swings. The VXX is holding roughly 50% of May and 50% June futures, so with the back month already at nearly 16, VXX holders are going to need a real move in VIX over the next two weeks to see a real spike. It is in no man’s land in my opinion to do anything with it. If the VIX back month could get to 18 or so, then VXX puts would come into play. The worst days for May historically are next week, so the selling got Â off to an early start. Usually, the market treats the first two days of May with kindness, yet a confluence of events on the calendar this year are making that difficult. The ECB tomorrow is expected to do more than just a rate cut, which is probably a useless tool anyway due to theÂ under-capitalizationÂ of the banking sector there. If they stand pat, the markets could get more turbulent. Commodities took a serious beating, and like I’ve said in past columns that has some meaning, especially with the dollar not exactly a headwind today. 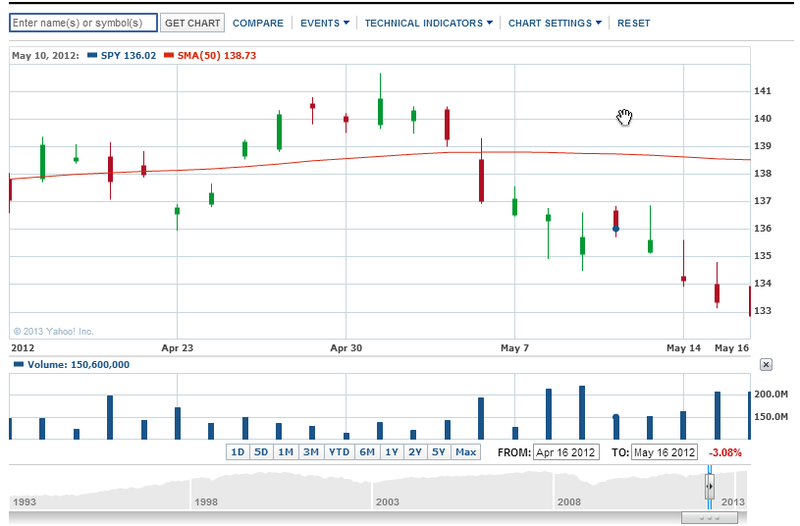 Put calendar in FB for .18 at $26 for May1/May. When you have an IV spread of over 50, it just begs for this kind of trade. Sold a DIA bear call spread at 145/146 for May for .77. The risk/reward on this is roughly 1 to 8. Looking for more of this type. Still holding IYT, QQQ, IWM, DIA, SPY, XRT, XLF, OIH puts for June. And short UTX and UPS bear call spreads. Of course, short VXX against all that. Like I’ve said in past columns, it is very, very rare for May to be a good month when no negative month preceded it in the current year. In 1985 it occurred, but then again, GDP that quarter was 7.1%. We’d be lucky to get 1.7% this year. Who knows, the trend is not broken.